Directly following President Obama’s changes to the Cuban Sanctions at the end of 2014, PARMA’s CEO, Bob Lord, traveled to Havana Cuba with the idea of meeting some of Cuba’s top talent and sharing some of the finest and most compelling contemporary US works with Cuban musicians. From that initial journey to Havana, Bob hand selected the groups and producers that PARMA would be working with, and we worked as a team to match contemporary US works from our composers with the various ensembles that we selected. produce a week of recording sessions and to embark upon a cultural program, spearheaded by our guide and translator Teresa Fernandez. The musicians and production teams were extremely prepared and collaborative, and we walked away with some truly special material. 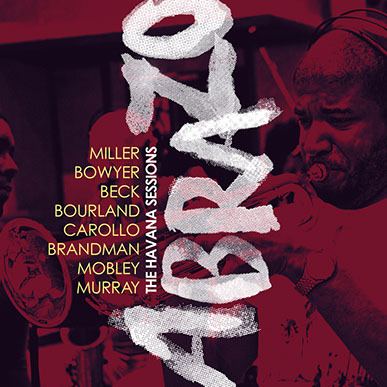 The recordings from our first trip will be featured on the new release, ABRAZO, our premiere release on the new Ansonica Records, out June 10th. Unlike Bob, this was my first trip to Havana. Though I prepared for months and sought advice (from our team and travel guides) as to how to prepare, nothing could have properly prepared me for the culture and beauty (and heat) of Cuba than actually experiencing it first hand. I’ve spent my entire life in the North East and I am undoubtedly accustomed to towns with populations of less than 20,000 with weather that averages 20-40 degrees F (-6-4 degrees Centigrade, for our non-US readers), so going to a densely populated city on a tropical island was certainly a change of pace, but it was a good one. The PARMA Team, CEO Bob Lord, VP of A&R and Licensing Sam Renshaw, PARMA Partner and Artist Michael Labrie, and myself (Alex Bourne), arrived in Cuba late at night on April 16th to prepare for our “People to People” program, which started April 18th. Because of travel restrictions, there are still no direct commercial flights from the US to Cuba, so travelers must connect to Cuba via a third country – Mexico City in our case. Mexico City is a city unlike any other I have seen. Flying at 10,000 ft, you can not see the end of the city in any direction, it seems to curve with the Earth. At night the image must be unreal. In stark contrast, flying into Havana at 9:00 PM on a Saturday, there were almost no visible lights on the ground. From above, Havana felt mysterious, eerie, and exciting, and I couldn’t wait to depart the plane and step foot on Cuban soil. Once we arrived, we were fortunate to get our baggage right away (unlike Bob’s last visit), and we made it to the city before midnight. Accompanying the PARMA team on this one-of-a-kind journey were five PARMA composers, Jeffrey Jacob, Heidi Jacob, Steven Block, Sergio Cervetti, and Christina Rusnak, a pianist, Charles Abramovic, and a cellist, Ovidiu Marinescu. Like all of our recordings projects, we worked with our artists to bring their music to the right players and production team to capture definitive versions of their music. Unlike many of our projects and as I mention above, we created a week-long musical and cultural program designed to give those visiting Havana background into Cuba’s rich musical culture. These activities involved meeting renowned Cuban musicians, attending musical workshops, touring historical sites and museums, and of course experiencing Cuban culture. Each day, Bob, Sam, and Michael would enter the studio with 1-2 of our composers and artists to record their music, while I would depart with the rest of the group for a day of activities and workshops. I cannot lie, I was extremely fortunate to be able to experience the culture with a group of people who were so eager to learn and explore the artistic side of Cuba. According to PARMA’s guide and translator, Teresa, Havana is a city of 2.2 million people, though locals think the population has reached 3 million. In the early 1900’s, Havana had huge developmental growth. It was on the upswing from devastation from wars and was on its way to becoming a leading economic country in it’s corner of the world. New homes, apartment buildings, luxury hotels, clubs, and casinos were built in the 30’s to accommodate tourism to Havana. In 1959, the new régime under Fidel Castro aimed to improve the quality of life for all Cubans. However, Castro’s communist model and the resulting U.S. embargo created shortages of supplies that affected Cuba and triggered an economic downturn which came to a head in 1991 when subsidies from the then Soviet Union ended. Since then, there has been an effort to rebuild the city – we saw this as a group in places such as Plaza Vieja and Plaza San Francisco in Old Havana. However, many buildings and structures are still in need of care and restoration. After our late arrival on Saturday night in Havana, we met as a group for the first time the following afternoon at a wonderful ocean-side restaurant, Vista Mar, which set the mood for what was a once in a lifetime experience. Instead, I accompanied the rest of the group on a walking tour of Old Havana guided by Teresa. We started at the Plaza San Francisco (right off the bay from Havana, where you will start to see Carnival Cruise ships landing) and continued through Plaza Vieja and into Plaza de Armas. Luck was on our side and we stumbled across the all women string orchestra, Camerata Romeu, rehearsing in a sanctuary in Plaza San Francisco. We ended the day with a trip to the Havana handcraft market – a large warehouse space with handmade crafts and stalls run by artists. The following day, Heidi Jacob and Charles Abramovic entered the studio to record a suite of Heidi’s work, “untouched by morning and untouched by noon,” featuring Charles on piano alongside a quartet of Cuban musicians. From all accounts, though a challenging session, we captured fantastic material from the group. That same day, the group and I headed to the Fresa y Chocolate Cultural Center (situated across the street from the Cuban Film Institute) to see a workshop for Tres with Efrain Amador Pinero. The Tres is a guitar-like instrument with three sets of double strings. The workshop was especially enlightening because Efrain is the founder of the School of Tres in Cuba. His playing has brought him the the US to perform in the past and he shared a recording of his Tres Concerto with the group – it was a wonderful blend of Cuban and traditional orchestral music. On Wednesday, I was finally able to get into the studio for a session with longtime PARMA composer, Steven Block, for the recording of his quintet “Puttin’ It Together.” The piece is very challenging (essentially written out free jazz), but the players absolutely nailed it in the studio. This was one of the most exciting and amazing sessions I have ever seen. That evening, we traveled to the Fortress of San Carlos de Cabana to witness the ceremonial (and weekly) cannon shot at 9:00 PM. Starting in the 18th century, the cannon shot signified the closing of the city gates and let residents know the city gates would be closing. While we were visiting the Fortress, cellist Ovidiu Marinescu entered the studio with Irakere (Chucho Valdes) percussionist Enrique Plá and our very own producer, Dayron Ortega, to produce an improvised session. The following day, longtime PARMA composer Sergio Cervetti entered the studio to record his clarinet quintet, “…and the huddled masses.” We had a wonderful session with Sergio and from what I heard, the players did a fantastic job preparing for the session. During the session, I accompanied the group to the Museum of Fine Art in Havana. The museum hosted a variety of modern and historic art from Cuban artists, including an iconic painting of a Cuban boxer defeating a US boxer. Friday April 22nd was the last day of our program in Havana. Oregon based composer Christina Rusnak worked with the very talented Ensemble Vocal Luna to record two choral works – a wedding song and a funeral song. Christina write a piece specifically with Vocal Luna in mind, and being a part of the process from conception to recording is a special privilege. That morning we were able to sneak out of Havana and head into the countryside to visit the home of Ernest Hemingway. As an avid reader of his work, this was very exciting for me. The house itself was situated far away from any majorly populated area. It was maintained perfectly and we were allowed to explore the property, including his pool where he hosted parties for various celebrities and guests. We returned as a group to attend a percussion workshop with Jose Eladio Amat, one of Cuba’s premiere percussionists Amat has participated in several music festivals alongside Sin Palabras, Irakere, Pancho Amat, and he has performed with several famous percussionists such as Luis Conte, Giovanni Hidalgo, Armando Peraza and Mamady Keita. Following the workshop, we traveled back to Plaza San Francisco, where we started our journey, to meet as a group for one last dinner. We dined at \Paladar Los Mercaderes to celebrate an unforgettable week of recording and adventure. Look out for news on each recording session in the coming months. In the meantime, you can listen ABRAZO, our premiere release on the new Ansonica Records, out June 10th! May Releases Out Now on Navona, Ravello, and Big Round Records!